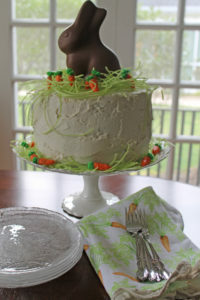 How about a four-layer vanilla bunny cake! 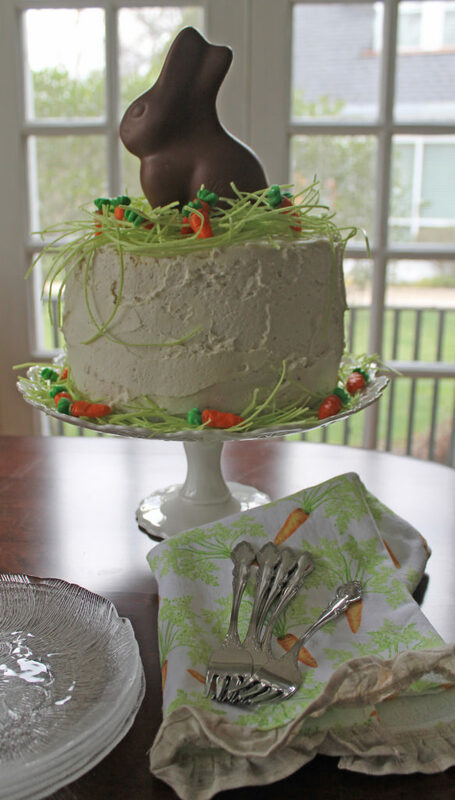 I’m sharing the recipe for the cake and buttercream frosting at the end of the post, but it is essentially a boxed cake mix with some extra ingredients added to enhance the flavor. 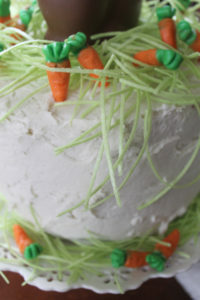 The fun part of this cake is decorating it after the layers are assembled and frosted. 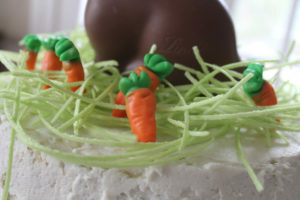 I kept it simple by using just three items…edible green grass, gummy carrot candies, AND THE BEST PART…the chocolate bunny! 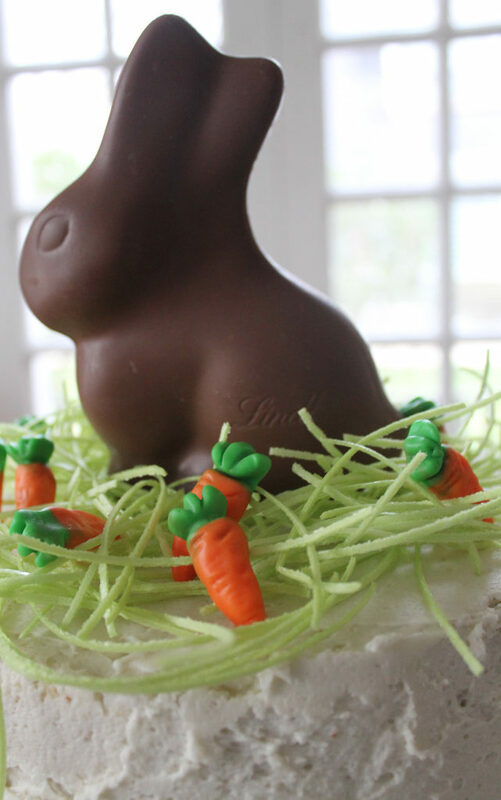 In a bowl, mix the cake mixes together with the milk, vegetable oil, and eggs using a beater. Add the vanilla. Pour the batter equally into four 9" round cake pans that have been greased and floured. Cool completely. Place cakes in the refrigerator to cool. Add one cup of powdered sugar and one tablespoon of milk, alternating until you have added 4-5 cups of powdered sugar. Add a little more powdered sugar or milk until you have the desired consistency. To assemble the cake, place the bottom layer on the cake stand that you will be using to serve the cake. 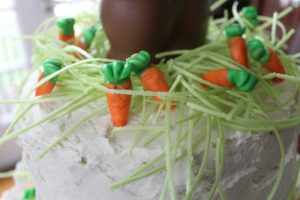 Top it with a light layer of frosting. Repeat with all four layers. 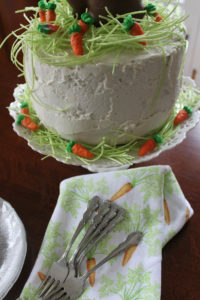 Cover the cake with a light layer of frosting. 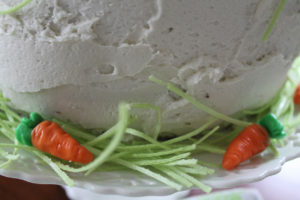 Place in the refrigerator for 30 minutes to seal in the first layer of frosting. Don't worry if there are crumbs showing, as you will cover those with the second layer of frosting. Remove the cake from refrigerator. Frost the cake with the rest of the frosting and decorate it as you wish.